Soon the icon of Batam will grow in line with the project implementation arrangement of the Mount Clare Batam Centre by making a large inscription reads "Welcome to Batam". The writing is on top of the hill is very large Klara once with a size of about 5 meters. We have had three letters that stand there. The workers of PT Hadi Lester looked still busy painting the inscription attached to the concrete terebut before penyanggahnya. If there are no constraints, some writing ahead of time that will stand strong and clearly visible to every visitor from abroad in particular. The paper was facing north or to the international port of Batam Centre. "This is part of the arrangement of the Mount Clare. Previously, this barren hill. Because it is necessary in order including the installation of posts Walcome to Batam with a large size. It will be one of the new icon of Batam. 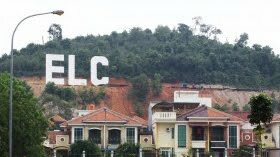 If people often remember writing that is located in Hollywood top of the hill, we, too, "said Hendri Yusfa, PR Pemko Batam when contacted on Sunday (21/11). The value of this project amounted to USD 472.4 million and has been planned since mid-2009. Yusfa explained, making it big writing is also part of the government agenda to introduce Batam, including parts to support the visit Batam. New stand alone three letters has now become a concern to many people, especially for riders who want to Hajj Batam Centre. From there, the direction this paper will be obvious. As long as there are no tall buildings that block them, then the post could actually be a new icon.